It is now one year since the Rio Olympic Games. In this series we will be looking back at some of the best moments from the Games. In the first instalment, Kim Song I reflects on winning bronze in Rio. Kim Song I from the Democratic People’s Republic of Korea found herself just one match away from a medal on her Olympic Games debut. It was the Women’s Singles bronze medal play-off, and her final hurdle to the podium was Japan’s Ai Fukuhara. Kim felt the pressure going in to the match. The bronze medal play-off has been a match that has made heroes and caused heartbreak. There is only space on the podium for three. On her Olympic Games debut Kim reserved her place. She dropped just one game in the bronze medal play-off. To make the day even more special, it was Kim’s 22nd birthday; she couldn’t have asked for a better present. When she returned home that appreciation was shown as the celebrations continued. And while the medal was won in Brazil, the Rio experience has followed her back home. While the Democratic People’s Republic of Korea is not the first country that springs to mind when thinking of a table tennis powerhouse, it should be. 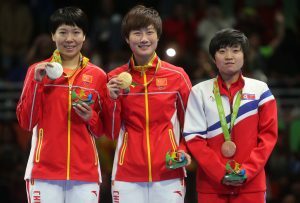 The nation has a strong legacy in the sport, and now has four table tennis medals from the Olympic Games to its name. Kim’s medal winning feat has sparked even more interest in the sport back home. It is a positive attitude to take away from her Olympic experience. Kim’s mind is always on improving, and her eye’s are firmly set on the future. In Tokyo 2020, Kim will be chasing even more success.